Having recently read Greg Lake’s biography and that of Phil Collins I was about ready for another book to read. As luck had it I was checking out my social media page when amongst the myriad of posts I happened upon one containing an image of a book that looked like it would just fit the bill. Said book was How Much Do We Get For This Gig Anyway? By Doug Melbourne. Doug who? I hear you say. Well Doug Melbourne is the founder member and keyboard player for ReGenesis who are in my opinion the leading genesis tribute band in the country. I had the pleasure of meeting Doug albeit too briefly following a gig in York on the bands Foxtrot at forty tour. He was busy packing away his keyboards whilst i was chatting to him. He seemed a warm and genuine chap to me and having read his book confirms my first impression. So, why would anyone want to read a book written by the keyboard player of a tribute band? My view is that talent is talent whether you are the keyboard player of Genesis playing complexed musical passages and solo’s or the keyboard player of ReGenesis playing the same ones (in some cases a tad better). How Much Do We Get For This Gig Anyway? Not only charts the Genesis of the band (pun absolutely intended) through their progression to a fully managed band having started playing in small London pubs to touring the provinces and the Netherlands and rehearsing at Real world studio Peter Gabriel’s now famous Wiltshire musical Mecca. Doug Melbourne’s writing style is very much documentary, humorous and above all entertaining. I lost count of the times I laughed out loud having read one of Doug’s observations with regards to his wealth of experience dealing with fellow musicians, promoters, venues and just what Genesis means to him. Doug’s seven levels of music categorising as he does a band/artists status within the music business are a revelation as are Doug’s view of guitarists, singers, brass players, drummers and bass players the latter being describes as “the beige area of the stage”. 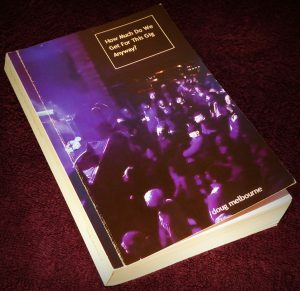 The sub heading of the book is “About Being In A Band” and chronicles Doug’s trials and tribulations about being the key person in the band and even a venue by venue journal on one of the bands major tours. Interestingly the book seems to have been mostly written for some time available via Kindle. The request by fans for a paper copy is covered in a postscript yet the most recent history of the band isn’t covered until page 273 in chapter 26 entitled What Happened Next? This was perhaps the most important part of the bands history for me personally as i didn’t get to see the band pre 2000. Doug Melbourne’s wit and ability to write verbatim kept me enthralled with his light hearted approach and streetwise delivery. Doug unlike many celebrity musicians who may well employ ghost writers doesn’t speak in tongues instead favouring a more earthy, descriptive and importantly believable presentation of what happened. Whatever your views of tribute bands or prog music are Doug Melbourne’s take on the genre will intrigue, bemuse and have you laughing your arse off . Despite the obvious difference between us both Doug being a talented musician and i merely writing about it I found it spooky as to how close our musical likes and dislikes run. His love for none Prog artistes like Pat Metheny and many others all run parallel with my own. For £3.85 from Amazon it’s a no brainer. A fun read for anyone who is in or has been in a band especially a tribute band How Much Do We Get For This Gig Anyway? will not fail to entertain. Doug may even temper any prejudice you may hoard about tribute bands.